According to the August 2018 RePEc ranking, EIEF ranks fourth among all economic research institutes in Italy, notwithstanding its small size, which penalizes the position in the ranking. According to an alternative RePEc ranking, which only considers the 10 top researchers in each institution, thus attenuating the effect of size, EIEF is the second in Italy (the first being IGIER-Bocconi), coming in at the 119th position among all the economic research centers in the world (7,600 institutions). In the worldwide ranking including all researchers EIEF ranks in the top 2%. Between 2008 (the year of EIEF’s creation) and 2018 EIEF’s researchers have published approximately 240 papers, half of which in the top 40 international economic and econometric journals, according to the Tinbergen Institute ranking; these publications are listed in the “Top Publications” page, distinguishing those on the 6 most important journals (a non controversial group in almost any ranking) and those on the following 34. In the same period 185 EIEF Working Papers were published. In 2017 EIEF was the host institution for 3 researchers awarded with a Grant from the European Research Council (ERC). At the end of the year one of the researchers awarded with a Grant left the Institute and went to Bocconi and in May 2018 another of these Grants expired, so that only one is currently hosted by EIEF. From 2008 to 2018 EIEF recruited 13 young researchers, all with a Ph.D. from the best universities worldwide, to work in Italy for relatively long periods (4 of them are Italian; 9 are those currently present at the Institute and 3 of them have been awarded a tenure position); EIEF has also attracted from abroad, again for relatively long periods, 4 senior researchers of sterling international reputations (3 Italian, 2 of whom still present); every year the Institute hosts, for shorter periods of time, between 50 and 60 researchers, typically working in foreign universities; many of these visits are recurrent and have favored fruitful and stable collaborations with resident researchers. EIEF offers academic services and cooperates with various Italian universities. In particular, it has complemented the Ph.D. programs of several universities by offering advanced graduate courses and supervision to selected Ph.D. students. So far, EIEF has stipulated conventions and agreements with 9 Italian universities (Turin, Venice Ca’ Foscari, Rome Tor Vergata, Rome La Sapienza, LUISS, Cassino, Naples Federico II, Naples Parthenope, Messina). Courses are free and the offer consists of about 250 hours of lessons per quarter, for two quarters; the number of students attending these courses every year is relatively stable, between 20 and 30. In some cases EIEF has offered students the possibility to work on their Ph.D. thesis under the supervision of one of EIEF’s researchers. 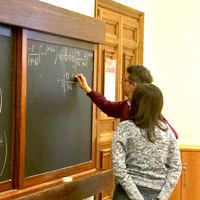 EIEF has also created a new Master’s program, which started in the academic year 2017-18: the Rome Masters in Economics (RoME). The program is addressed to a small group of highly talented and strongly driven students; it aims at competing with the best Master’s programs in Europe. This project is carried out in cooperation with LUISS university. The start of RoME has entailed EIEF modifying its offer of courses for Ph.D. students of various universities, to better integrate it with the RoME program. These initiatives are to be considered as stepping stones towards the creation, in the medium term, of a “Rome School of Economics” – much like those existing in London, Paris, Barcelona, Stockholm, Toulouse – aggregating the best available resources in the Roman universities and offering internationally qualified, higher education training in economics. As a rule EIEF organizes two weekly seminars (one more macro/theory and the other more applied/empirical), and offers many lunch seminars and brief cycles of lectures (special lectures) on specific topics. On average EIEF hosts about 120 seminars every year, with an average attendance of 20 people; in the summer, the seminar activity further intensifies, as the Institute can take advantage of the presence of visitors, offering a useful overview of the research at the frontier. 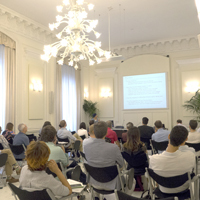 From 2010 to 2018 a total of 21 special lectures, on various topics, and on average about 8 conferences and workshops every year were organized. These scientific events were attended by academics, central bank and international institution officials, economic and financial sector representatives. 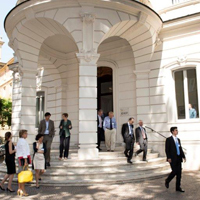 Occasional meetings were organized with exponents from academia, economic and financial experts and policy makers to have an informal exchange of view on issues relevant in the policy debate, maintaining at the same time a rigorous analytical approach. Participation for all the events is free; the calendar is on the EIEF’s website, and information on the various events is sent via e-mail to a wide list of potentially interested people. EIEF funds research projects proposed by young researchers based in Italy (EIEF’s researchers are not allowed to apply). 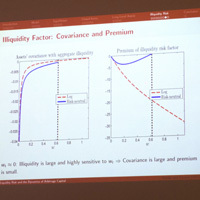 EIEF strives to finance projects having a good chance to be published in journals with high reputation. From 2008 to 2017 a total of 55 projects have been funded. Taking into account the long delays of the publication process it can be estimated that about 50% of the awarded projects have been published in journals of the desired quality.